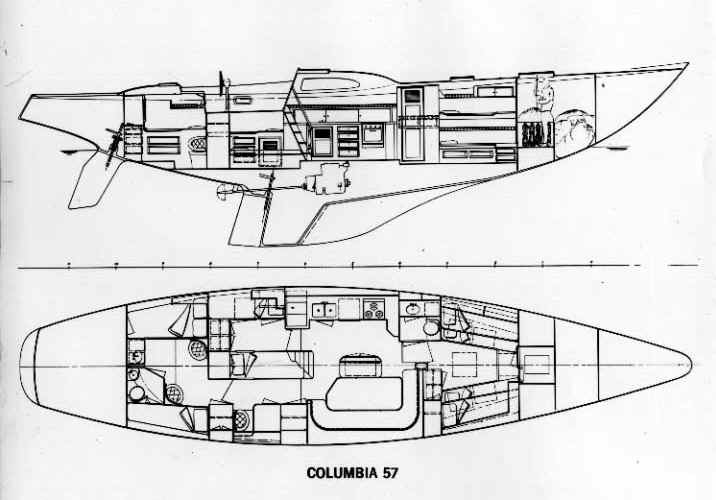 The Bill Tripp Sr. designed Columbia 57 debuted in 1968 and continued in production until at least 1971. The builder is listed as Columbia Yacht Corporation, Subsidiary of Whittaker Corporation. The 57 was designed in 1968, and hull number one was ready for the 1969 transpac. She won class A. The 57 was the last boat that Tripp designed to the CCA rule for Columbia, and truly one of the most beautiful. Earlier collateral (magazine ads) had the LWL at 40' even and the displacement at 42K pounds. Obviously, she gained a little weight on her way from the drawing board to the water (very common). I've been told that the first C-57 was named Concerto. This Columbia 57 held a constant 13 knots over a 10 mile course from the Oakland Bay Bridge to Brisbane in the South Bay in 1987, outrunning a Grand Banks Trawler. We were flying a main and a 150. At the end when we turned up wind the 150 blew out, actually more like blew up and shattered into a million pieces. I had to change my shorts. Feeling and seeing 22,000 pounds get up on a plane is probably at once the most scary and exciting thing I have ever experienced. The Columbia 57 was introduced in 1969 as the nation's largest production fiberglass sailboat. 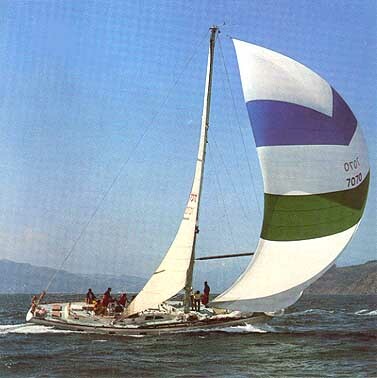 The 57, designed by Bill Tripp, displayed several of the trademark features of his successful ocean racing yachts: an unusually long effective waterline, high aspect ratio sail plan, dual surface steering system with a keel-mounted trim tab as well as a balanced spade rudder aft. Speed was derived partially from an absolute minimum of wetted surface area, and from the high prismatic coefficient hull design. 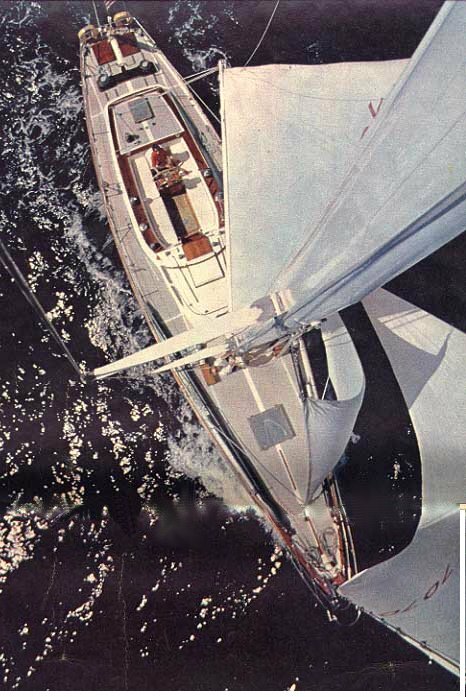 The 57 was the flagship of Columbia Yachts in the late 60's and early 70's. Twelve Columbia 57's were built.